Some users use scripts very often. The scripting tool has a good highlighting and is easy to use for small scripts and changes of scripts. For users who want to create big scripts with many classes it is better to develop in visual studio. You can download the free express version from microsoft under https://www.visualstudio.com/en-us/products/visual-studio-express-vs.aspx. It's important to download the desktop version to open our example. We have added two references to the project. First PCB-Investigator-Demo from the standard installation directory. 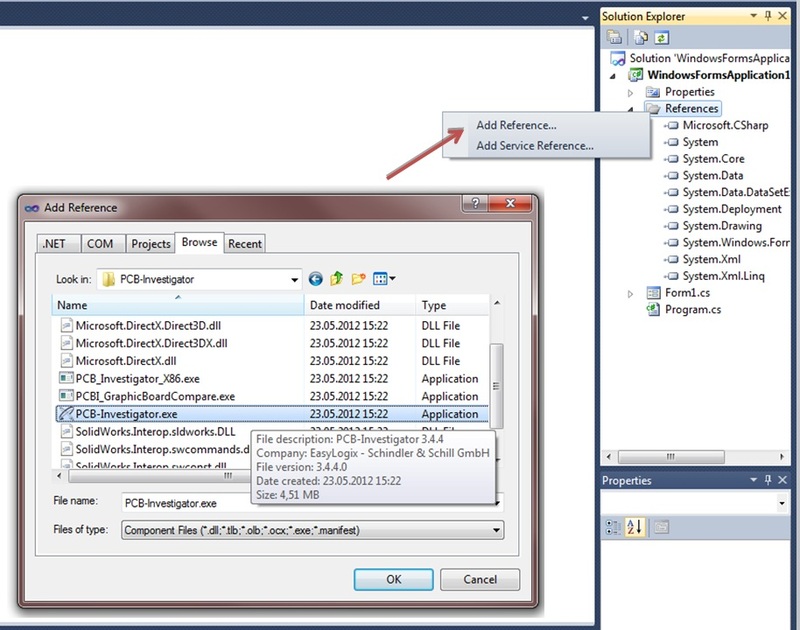 Than PCB-Investigator-Scripting.dll from the PlugIn subdirectory. At the end after developing your script with all comfort of visual studio you can import the class ScriptExample.cs in to your scripting tool or copy the code in an empty script. // Template to show windows form for synchronous script.